This recipe is a winner - it's fast, tastes fabulous and is sure to win your . 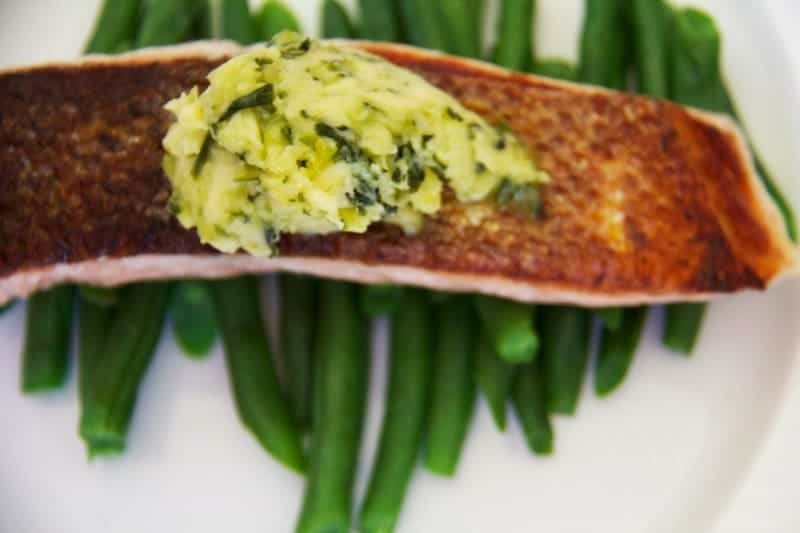 salmon fillets, skin on 1 tsp garlic paste (or finely chopped garlic) 1 tbs coriander paste (or finely chopped coriander leaves) 1 tsp wasabi paste 80g butter, softened. I’m not used to being in the hot seat, but lately I’ve been on the receiving end of some big questions. My latest interview was for Inspired: top 100 food bloggers who have been kind enough to include me in their list of fabulous food bloggers from around the globe. I know, ridiculous huh? I can’t quite believe it either. I’m a notorious over-thinking, so most of the questions took (too) much consideration, but one answer I knew straight away: What’s your signature dish? it’s simple. Not much mucking around required means more time enjoying the company of your guests. (More wine for me). it’s a little bit fancy. It’s a dish that looks like you spent hours in the kitchen, when you really spent hours trying to tidy the house for fear your guests see how your family really live. (We’re a household of messers). it’s loaded with good fats. Not only is fat flavoursome, it also helps our bodies realise they’re satiated. (fat is my friend). it’s a game changer. I cooked this recipe for Dominique Rizzo and Skye Craig at the Good Food and Wine Festival a few years ago and won a trip to Noosa with a bunch of other bloggers I now call friends. (I molested a fish on stage, how I still won I have no idea). 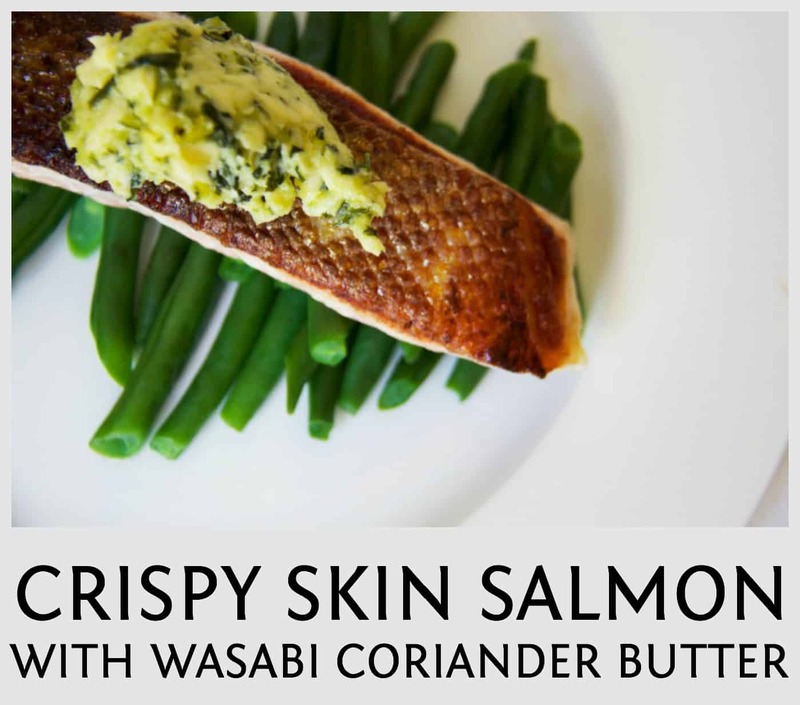 This crispy skin salmon with wasabi coriander butter is a great way to wow guests with little time and zero fuss. Combine all the ingredients for the butter in a small bowl and stir to combine. Return to the fridge to firm if necessary.Pin-bone the salmon and dry the skin with a piece of paper towel. Add the olive oil and butter to a non-stick fry pan over very high heat until the butter begins to foam. Add the salmon skin side down and cook for about three minutes, until the skin is crisp. Don’t flip the fish!Reduce the heat, cover the pan and cook for a few more minutes. The salmon should still be a little rare on the top of the fillet. 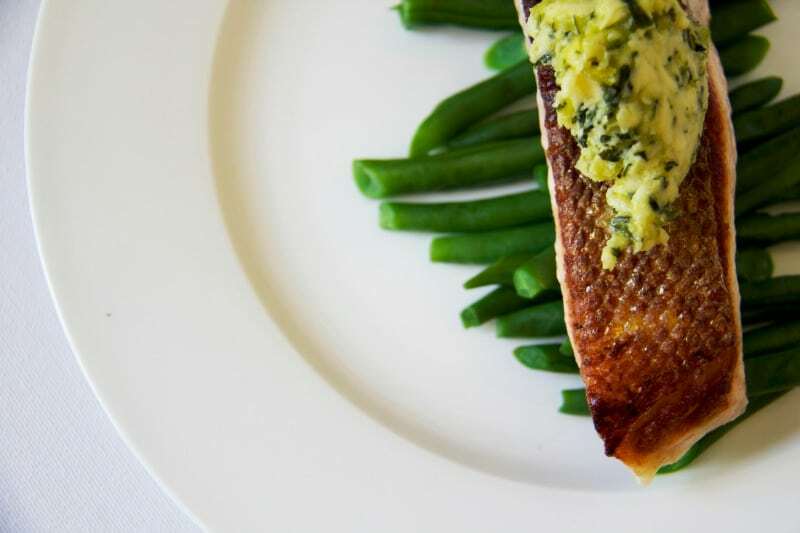 Serve the salmon pieces on a bed of green beans with a dollop of the wasabi and coriander butter on the top. I’m in some pretty fancy company in Inspired’s list, many of the blogs on the list are written by my idols. You can read the magazine in the window below, but before you do tell me…. Can you believe it was so long ago now Anne?